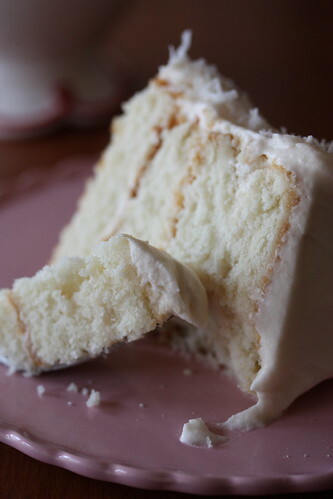 This month's installment of The Cake Slice features Southern Coconut Cake. So far, every recipe that I've made out of Sky High: Irresistible Triple-Layer Cakes has exceeded my expectations, and I highly recommend that you go out and treat yourself to this cookbook. 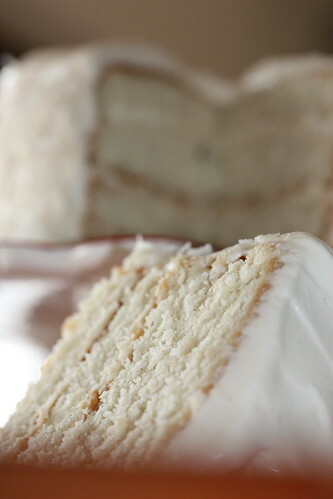 Impossibly moist white cake layers are subtly flavored with unsweetened coconut milk, enveloped by a cream cheese buttercream frosting (I gained 5 pounds just typing those words) and covered with sweetened flaked coconut (oops, another 5 pounds). With all of the cake making happening in my kitchen this month, I cut the recipe in half and baked the cake layers in two 6" round pans. The instructions for the cake were pretty straightforward, and the layers were baked without a hitch. The cream cheese buttercream frosting is a bit more involved to coordinate the whipping of the egg whites and heating of the sugar, but the efforts will be rewarded with a frosting that has all the flavor of your traditional cream cheese frosting but with a lighter, fluffier consistency. Good grief, I could have eaten an entire batch this frosting right out of the bowl! The assembled cake is really beautiful, and I thought the coconut flavor in the cake was nice and subtle. Again, the frosting was out of this world delicious and it wasn't coyingly sweet or rich...perfect!! This recipe is on my short list for my friends J&T. You see, they are getting married this September, and I've been honored with the responsibility for their wedding cupcakes and dessert display. Am I just a bit panicked? --- absolutely!!! Aside from the nervousness, I'm really excited about the opportunity to create something delicious for people that I adore. I'm going to try this recipe out in cupcake form and see how it turns out... wish me luck! STUNNING!What a beautiful cake! Yours came out picture perfect. I'm sure this will be said many time in your coming comments... but wow! This cake could very well pass for a wedding one! Beatifully done. 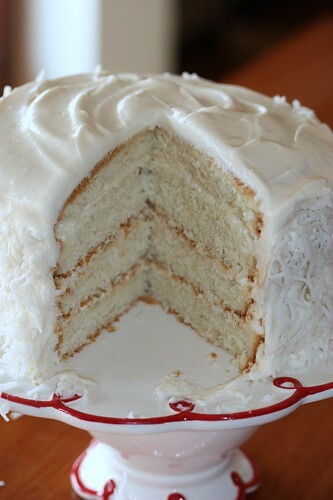 Love the whiteness of the cake and the frosting and the layers looks so deliciously moist. Your coconut cake looks wonderful! YUM! So pretty Linda! And good luck with the cupcakes. I would love to see them! Holy jeez- this is an absolutely gorgeous cake!! 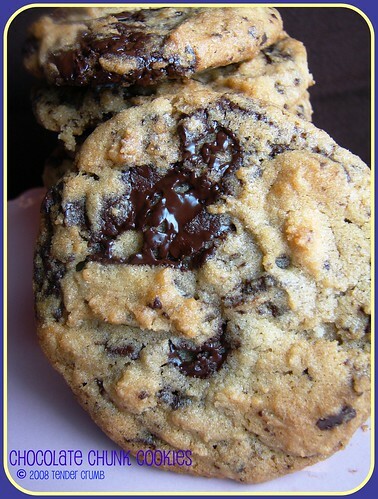 I'm seriously drooling and looking at my watch thinking, "hmm, I wonder if I have time to make this tonight?" YUM!!!! Absolutely stunning. This looks amazing! I want a slice. What a gorgeous cake. Coconut cake is one of my favorites. Thanks for sharing. You put an asterisk next to the cream cheese and the flour - were there special instructions? Your cake looks beautiful! I know what you mean about the fluffy cake layers and the dreamy buttercreamm. Love your photos. now that's a cake! looks great on that cute cakestand, too. i agree about the frosting--way too good! I love coconut cake but haven't come across a recipe for it using coconut milk. It sounds like it would be delicious. Your cake looks spectacular!!! Wonderful photos. 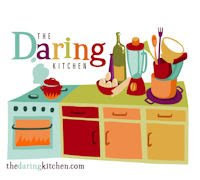 That is awesome that you're making the desserts for your friends. I'll keep my fingers crossed that all goes well. I like that you left the left the top plain. And four layers.... Beautiful! Your cake is gorgeous! And your photography is gorgeous too! Great job on your cake. I had some leftover batter and made cupcakes. They didn't have that nice domed top that box mix cupcakes have, but they tasted amazing, and no one would see the top underneath all the frosting and coconut anyway! You are so my blog friend. Your baking pics are the bomb. I am so loving this cake. i love your cake plate! I am making this cake right now as we speak! The only thing that I have come across that is confusing is that in the frosting directions, you mention adding vanilla with the cream cheese, but you do not list that in the ingredients. So, do you put vanilla in there? I did just in case, there was no way I was going to mess this cake up! What's a little vanilla going to hurt anyway! I have a question regarding the process in which you assemble the cake batter. Its different from the standard procedure where you cream the butter and sugar together first, then add the dry and liquid - is there a reason for the way this batter is put together the way it is? I have made this cake twice within a week and both times it got rave reviews. 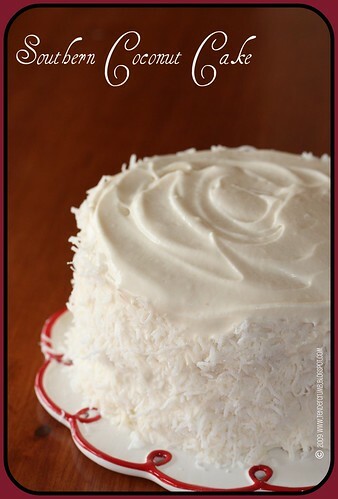 This is definitely the coconut cake recipe that I will be using from here on. has anyone has problems...with the eggs cooking once you pour in the hot sugar mix? If you heat the sugar to the approrpiate temperature and gradually incorporate it into the egg whites, the eggs should heat and you won't have to worry about raw eggs. As long as you add the sugar gradually while you're whipping the egg whites, you won't have scrambled eggs. The frosting is a bit loose, thus needing the refridgeration to get a better texture to frost the cake. With that said, would definitely recommend storing the cake in the fridge (not necessarily overnite) before serving. I plan on baking the cake Saturday afternoon.....and then serving on Sunday...because there will be NO time on Sunday to make anything. If I bake Saturday afternoon...I should put the cake in the refrigerator until Sunday afternoon....should that be okay? So it will be a little under 24 hours in the refrigerator. But I should NOT...put the frosting in the fridge than ice later right? I should ice the cake when the icing is made? The cake, whether it is in its separate components or assembled should do just fine in the fridge overnite. if you're just storing the cake layers, would recommend wrapping each layer in plastic wrap so the exterior doesn't dry out. You could actually assemble the cake and it should hold in the fridge overnight without a problem (that I've done without a hitch). My grandmother and great grandmother always made this cake for Easter. I am making it for my in laws for the first time and my mother in law is a chef...so I need it to be perfect so she doesn't criticize me. I plan on this....make the icing first....and put it in the refrigerator to chill for awhile....and then start making the layers. I will ice the cake on Saturday...and keep it in the refrigerator assembled overnight....so nothing dries out. That way...I can just pull it out of the refrigerator Sunday to eat! do you think I should take it out of the fridge so it has time to warm up for 3 hours or so? or does it taste good cold? I just tried to make the icing. The cream cheese mixture was no problem and so incredibly yummy and fluffy. The egg whites whipped up fine. But when I made the syrup, the sugar didn't dissolve all the way, it went hard on the side of the bowl...then when i added the cream cheese mixture to the otherwise fine and fluffy egg whites + syrup, the whole mixture collapsed and turned runny instead of fluffy. I am sure it is too loose to use on the cake and the amount seems less than the cream cheese mixture was originally. Can anyone help? When you are heating the sugar and water, just as the mix starts to boil, use a basting brush and brush water just above the water line. This will keep the sugar from crystalizing along the edge. you can do this a few times, but once is usually enough. And do not stir! Did you be sure to add the cream cheese mix slowly? You can also try folding half the egg whites in the cream cheese mixture to lighten it up before folding the rest together. granted I haven't made this yet, these are just some typical fixes. Hope that helps! I can't wait to try this cake! I ended up going with other recipes for my friend's wedding, so have yet to go the cupcake route for this recipe. I would definitely recommend that you take this recipe for a test run in cupcake form, as some cake recipes can be a bit dry as cupcakes. As a full size cake, the layers are perfectly moist, so this recipe should translate well into cupcakes. I love it! The sponge itself is wonderful. I ended hand folding the meringue into the cream cheese for the second batch I tried and it came out a bit fluffier than the first. I'm definitely gonna have to try the frosting again on a few other cakes! Beautiful Cake! I LOVE coconut. This looks wonderful. Hi Linda, thanks for the recipe looks delicious! One question: the egg whites should be beaten until stiff before adding the syrup? I will start mixing the egg whites. When the whites get frothy (which won't take long at all), I will slowly drizzle in the syrup, then beat the mixture until it reaches stiff peaks. Hice el pastel el fin de semana y quedó delicioso!!! Hi I baked this yesterday and it was yummy. One problem though is that the Cake did not come out firm.I ha hard time removing parchment paper on each layers it was stuck even if I greased it before and when I lift the cake it breaks. Would you happen to know what I did wrong? Thanks! OMG! I stumbled upon this recipe, and I needed to make a show stopper, something so perfect it would leave people in silent bliss as they ate it, and this one did the trick. I made it, and it was perfection, the texture of the cake is so luxurious, and the frosting, only one words describes it, WOW. My grandma had some and she was a baker for 30+ years, she was amazed, and that isn't said lightly, we take our desserts very seriously, I converted former coconut haters today, and I thank you for the recipe. Now, I have to find that book you mentioned! I'm making this now- i believe I've followed instructions very close but my frosting is more like a heavy glaze and I'm afraid it won't stick to the cake, I've added a bit of extra powdered sugar to help but no such luck. Any ideas??? Hi, I found your blog by coincidence(I'm from Germany). I tried to make this lovely cake yesterday and my big problem is the buttecream frosting. It doesn't get stiff! Maybe I translated something wrong or maybe I converted it wrong from cups/spoons to grams and ml? My question is, did I get it right, that in the end you mix the buttercream-creamcheese mixture with the eggwhite-syrup mixture????? On your photo the cream around the cake and on top of the cake is so super white, is that the buttecream-creamcheese mixture with the eggwhite-syrup mixture together? The buttercream makes it all a bit yellow, because of the butter and when I mix it with the eggwhite-syrup mixture it is not so super white, it is more yellow. So is this on top and around the cake only the eggwhite-syrup frosting, without the buttercream-creamcheese? Thank you so much for this beautiful recipie. I hope I will get it right, because this cake is fantastic!!! I wish you HAPPY EASTER from Germany! I have made this cake twice and am looking forward to another excuse to make it. I follow the recipe to a "T" and the cake sponge comes out absolutely perfect; so perfect that I have decided to use this sponge recipe when making wedding cakes from now on.. And the light & fluffy cream cheese frosting recipe is absolutely dreamy. One of my favorite and most flattering compliments came from a precious senior citizen, "This tastes just like mama's". completely fell apart and there is no way you can hold this in your hand to flip over. it comepletely fell apart and I had to make something else. tasted ok, but too crumbly. 1 star for flavor. I just tried this recipe. I've made the cake before in the past and it's pretty good. This was my first time making the frosting. I followed this recipe to a T and I must say it was a bust. At first I was excited because I hate buttercream. I can't stand the taste of powdered sugar and I hate how some recipes call for as much as 6 cups! Gross! I was pleased that this recipe only called for one cup of powdered sugar. I tasted the frosting before I had added the egg white/sugar mixture and I thought it was the perfect level of sweetness. I will say, however, I was disappointed at how lumpy it was. I blended it really well and I had a ton of little butter lumps that just would not break down. So I think that the butter should be creamed in the mixer first, THEN add the cream cheese. Not the other way around. I'd rather have lumps of cream cheese in my frosting than butter! At that point I was also concerned about the consistency. It was pretty thin. I'm glad that I purchased a stand mixer because beating the egg white/ sugar mixture took 10-15 minutes to get it to the right texture. The final consistency of this frosting was more like a glaze. I even added an extra cup of powdered sugar and 4 teaspoons of cornstarch to try and thicken up, but to no avail. I was pretty disappointed because the whole reason I baked a cake was because I wanted to decorate it with frosting. If you want to pipe frosting on a cake, this is not the recipe for the job! I will say the taste is good. Although it would have tasted better if I didn't have to add the extra cup of sugar. I would make the cake again, even though it's kind of time consuming. I think I would try and find a different frosting.